Vaughan-Jackson's first report of extensor tendon rupture described two elderly laborers with degenerative arthritis of the distal radioulnar joint (DRUJ). He found that the tendons were frayed and disrupted directly over a bony prominence projecting from the head of the ulna in both cases. In a subsequent report,  Vaughan-Jackson described the process of attritional rupture of the digital extensor tendons in the rheumatoid hand, with which his name has become associated. Rheumatoid arthritis (RA) is the most common underlying etiology of tendon rupture in the hand and wrist and is the usual clinical setting in which the term Vaughan-Jackson syndrome is employed. 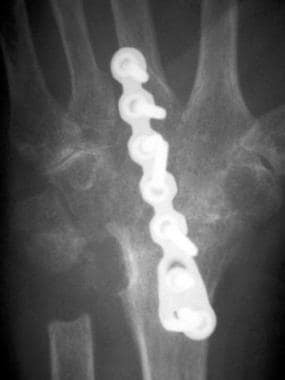 Posteroanterior radiograph of the wrist following wrist arthrodesis and resection of the distal ulna displays the scallop sign, which is the term used to describe the scooped-out appearance of the sigmoid notch of the radius that results from synovial proliferation and bone erosion. In a study of 58 rheumatoid hands with tendon rupture,  73% of the hands had two or more of these risk factors, and 93% of the patients with tendon rupture were noted to have persistent tenosynovitis for 6 months, making this finding particularly worrisome. A review of 41 wrists with extensor tendon rupture due to DRUJ osteoarthritis found that tendon disruption occurred only in those joints with severe radiographic changes. Specifically, widening and deepening of the sigmoid notch of the radius (the scallop sign) was the radiographic finding most strongly associated with tendon rupture in these osteoarthritic patients. Patients with RA are remarkably adept at coping with hand deformity and dysfunction. In patients with relatively normal MCP joint function, loss of the ability to extend the digits and open the hand to grasp large objects imparts obvious functional limitations. Other individuals with severe MCP joint deformity or subluxation may not even be aware that extensor tendon rupture has occurred. The services of a certified hand therapist are invaluable in educating patients on the postoperative regimen. Splint use and activity restriction must be adhered to in order to prevent disruption of the tendon graft or transfer. Perhaps the most important lesson that can be imparted to these patients is an understanding of the warning signs and risk factors that may indicate the possibility of impending tendon rupture in the contralateral limb. VAUGHAN-JACKSON OJ. Rupture of extensor tendons by attrition at the inferior radio-ulnar joint; report of two cases. J Bone Joint Surg Br. 1948 Aug. 30B (3):528-30. [Medline]. [Full Text]. Vaughan-Jackson OJ. Attritional ruptures of tendons in the rheumatoid hand (abstract). J Bone Joint Surg Am. 1958. 40A:1431. Moore JR, Weiland AJ, Valdata L. Tendon ruptures in the rheumatoid hand: analysis of treatment and functional results in 60 patients. J Hand Surg Am. 1987 Jan. 12 (1):9-14. [Medline]. Mannerfelt L, Norman O. Attrition ruptures of flexor tendons in rheumatoid arthritis caused by bony spurs in the carpal tunnel. A clinical and radiological study. J Bone Joint Surg Br. 1969 May. 51(2):270-7. [Medline]. [Full Text]. Newmeyer WL, Green DP. Rupture of digital extensor tendons following distal ulnar resection. J Bone Joint Surg Am. 1982 Feb. 64(2):178-82. [Medline]. Teplitz GA, Bisson LJ, Weiland AJ. Rupture of digital extensor tendons following distal ulnar resection and extensor carpi ulnaris stabilization: a case report. Am J Orthop. 1996. 25:230-32. Jain A, Brennan F, Troeberg L, Nanchahal J. The role of matrix metalloproteinases in rheumatoid tendon disease. J Hand Surg Am. 2002 Nov. 27 (6):1059-64. [Medline]. Williamson SC, Feldon P. Extensor tendon ruptures in rheumatoid arthritis. Hand Clin. 1995 Aug. 11 (3):449-59. [Medline]. Ducloyer P, Leclercq C, Lisfranc R, Saffar P. Spontaneous ruptures of the extensor tendons of the fingers in Madelung's deformity. J Hand Surg Br. 1991 Aug. 16 (3):329-33. [Medline]. Engkvist O, Lundborg G. Rupture of the extensor pollicis longus tendon after fracture of the lower end of the radius--a clinical and microangiographic study. Hand. 1979 Feb. 11 (1):76-86. [Medline]. GLADSTONE H. Rupture of the extensor digitorum communis tendons following severely deforming fractures about the wrist. J Bone Joint Surg Am. 1952 Jul. 24 A (3):698-700. [Medline]. Inoué G. Attritional rupture of the extensor tendon due to longstanding Kienböck's disease. Ann Chir Main Memb Super. 1994. 13 (2):135-8. [Medline]. Mazhar T, Rambani R. Vaughan-Jackson-like syndrome as an unusual presentation of Kienböck's disease: a case report. J Med Case Rep. 2011 Jul 25. 5:325. [Medline]. [Full Text]. Lowry KJ, Gainor BJ, Hoskins JS. Extensor tendon rupture secondary to the AO/ASIF titanium distal radius plate without associated plate failure: a case report. Am J Orthop (Belle Mead NJ). 2000 Oct. 29 (10):789-91. [Medline]. Taniguchi Y, Yoshida M, Tamaki T. Subcutaneous extensor tendon rupture associated with calcium pyrophosphate dihydrate crystal deposition disease of the wrist. J Hand Surg Br. 1997 Jun. 22 (3):386-7. [Medline]. Niwa T, Uchiyama S, Yamazaki H, Kasashima T, Tsuchikane A, Kato H. Closed tendon rupture as a result of Kienböck disease. Scand J Plast Reconstr Surg Hand Surg. 2010 Feb. 44 (1):59-63. [Medline]. Iwamoto T, Toki H, Ikari K, Yamanaka H, Momohara S. Multiple extensor tendon ruptures caused by tophaceous gout. Mod Rheumatol. 2010 Apr. 20 (2):210-2. [Medline]. Katayama T, Ono H, Furuta K. Osteochondroma of the lunate with extensor tendons rupture of the index finger: a case report. Hand Surg. 2011. 16 (2):181-4. [Medline]. Shah NR, Wilczynski M, Gelberman R. Osteochondroma of the capitate causing rupture of the extensor digiti minimi: case report. J Hand Surg Am. 2009 Jan. 34 (1):46-8. [Medline]. Haug LC, Glodny B, Deml C, Lutz M, Attal R. A new radiological method to detect dorsally penetrating screws when using volar locking plates in distal radial fractures. The dorsal horizon view. Bone Joint J. 2013 Aug. 95-B (8):1101-5. [Medline]. Freiberg RA, Weinstein A. The scallop sign and spontaneous rupture of finger extensor tendons in rheumatoid arthritics. Clin Orthop Relat Res. 1972 Mar-Apr. 83:128-30. [Medline]. Ryu J, Saito S, Honda T, Yamamoto K. Risk factors and prophylactic tenosynovectomy for extensor tendon ruptures in the rheumatoid hand. J Hand Surg Br. 1998 Oct. 23 (5):658-61. [Medline]. Yamazaki H, Uchiyama S, Hata Y, Murakami N, Kato H. Extensor tendon rupture associated with osteoarthritis of the distal radioulnar joint. J Hand Surg Eur Vol. 2008 Aug. 33 (4):469-74. [Medline]. Kwon ST, Schneider LH. Extensor tendon ruptures in rheumatoid hands. Hunter JM, Schneider LH, Mackin EJ, eds. Tendon and Nerve Surgery in the Hand: A Third Decade. St Louis: Mosby Year Book; 1997. 434-8. Sakuma Y, Ochi K, Iwamoto T, Saito A, Yano K, Naito Y, et al. Number of ruptured tendons and surgical delay as prognostic factors for the surgical repair of extensor tendon ruptures in the rheumatoid wrist. J Rheumatol. 2014 Feb. 41 (2):265-9. [Medline]. Itsubo T, Uchiyama S, Yamazaki H, Hayashi M, Nakamura K, Kuniyoshi K, et al. Factors affecting extension lag after tendon reconstruction for finger extensor tendon rupture due to distal radioulnar lesion. J Orthop Sci. 2016 Jan. 21 (1):19-23. [Medline]. Gong HS, Lee JO, Baek GH, Kim BS, Kim JY, Lee JS, et al. Extensor tendon rupture in rheumatoid arthritis: a survey of patients between 2005 and 2010 at five Korean hospitals. Hand Surg. 2012. 17 (1):43-7. [Medline]. Wilson RL, DeVito MC. Extensor tendon problems in rheumatoid arthritis. Hand Clin. 1996 Aug. 12 (3):551-9. [Medline]. Millender LH, Nalebuff EA, Holdsworth DE. Posterior interosseous-nerve syndrome secondary to rheumatoid synovitis. J Bone Joint Surg Am. 1973 Jun. 55 (4):753-7. [Medline]. Murray PM. Current concepts in the treatment of rheumatoid arthritis of the distal radioulnar joint. Hand Clin. 2011 Feb. 27 (1):49-55. [Medline]. Ishikawa H, Hanyu T, Tajima T. Rheumatoid wrists treated with synovectomy of the extensor tendons and the wrist joint combined with a Darrach procedure. J Hand Surg Am. 1992 Nov. 17 (6):1109-17. [Medline]. Thirupathi RG, Ferlic DC, Clayton ML. Dorsal wrist synovectomy in rheumatoid arthritis--a long-term study. J Hand Surg Am. 1983 Nov. 8 (6):848-56. [Medline]. Rubens DJ, Blebea JS, Totterman SM, Hooper MM. Rheumatoid arthritis: evaluation of wrist extensor tendons with clinical examination versus MR imaging--a preliminary report. Radiology. 1993 Jun. 187 (3):831-8. [Medline]. De Maeseneer M, Marcelis S, Osteaux M, Jager T, Machiels F, Van Roy P. Sonography of a rupture of the tendon of the extensor pollicis longus muscle: initial clinical experience and correlation with findings at cadaveric dissection. AJR Am J Roentgenol. 2005 Jan. 184 (1):175-9. [Medline]. Sunagawa T, Ishida O, Ishiburo M, Suzuki O, Yasunaga Y, Ochi M. Three-dimensional computed tomography imaging: its applicability in the evaluation of extensor tendons in the hand and wrist. J Comput Assist Tomogr. 2005 Jan-Feb. 29 (1):94-8. [Medline]. Ishikawa H, Abe A, Murasawa A, Nakazono K, Horizono H, Ishii K, et al. Rheumatoid wrist deformity and risk of extensor tendon rupture evaluated by 3DCT imaging. Skeletal Radiol. 2010 May. 39 (5):467-72. [Medline]. Abe A, Ishikawa H, Murasawa A, Nakazono K. Extensor tendon rupture and three-dimensional computed tomography imaging of the rheumatoid wrist. Skeletal Radiol. 2010 Apr. 39 (4):325-31. [Medline]. Soni P, Stern CA, Foreman KB, Rockwell WB. Advances in extensor tendon diagnosis and therapy. Plast Reconstr Surg. 2009 Feb. 123 (2):727-8. [Medline]. Bruyn GA, Möller I, Garrido J, Bong D, d'Agostino MA, Iagnocco A, et al. Reliability testing of tendon disease using two different scanning methods in patients with rheumatoid arthritis. Rheumatology (Oxford). 2012 Sep. 51 (9):1655-61. [Medline]. McAuliffe JA. General clinical considerations in rheumatoid surgery. Weiss A-PC, Hastings H, eds. Surgery of the Arthritic Hand and Wrist. Philadelphia: Lippincott Williams & Wilkins; 2002. 27-37. Howe CR, Gardner GC, Kadel NJ. Perioperative medication management for the patient with rheumatoid arthritis. J Am Acad Orthop Surg. 2006 Sep. 14 (9):544-51. [Medline]. Brown FE, Brown ML. Long-term results after tenosynovectomy to treat the rheumatoid hand. J Hand Surg Am. 1988 Sep. 13 (5):704-8. [Medline]. Hsueh JH, Liu WC, Yang KC, Hsu KC, Lin CT, Chen LW. Spontaneous Extensor Tendon Rupture in the Rheumatoid Wrist: Risk Factors and Preventive Role of Extended Tenosynovectomy. Ann Plast Surg. 2016 Mar. 76 Suppl 1:S41-7. [Medline]. Bora FW Jr, Osterman AL, Thomas VJ, Maitin EC, Polineni S. The treatment of ruptures of multiple extensor tendons at wrist level by a free tendon graft in the rheumatoid patient. J Hand Surg Am. 1987 Nov. 12 (6):1038-40. [Medline]. Nakamura S, Katsuki M. Tendon grafting for multiple extensor tendon ruptures of fingers in rheumatoid hands. J Hand Surg Br. 2002 Aug. 27 (4):326-8. [Medline]. Chung US, Kim JH, Seo WS, Lee KH. Tendon transfer or tendon graft for ruptured finger extensor tendons in rheumatoid hands. J Hand Surg Eur Vol. 2010 May. 35 (4):279-82. [Medline]. O'Sullivan MB, Singh H, Wolf JM. Tendon Transfers in the Rheumatoid Hand for Reconstruction. Hand Clin. 2016 Aug. 32 (3):407-16. [Medline]. Smith RJ. Tendon Transfers of the Hand and Forearm. Boston: Little, Brown; 1987. 215-43. Chuinard RG, Boyes JH, Stark HH, Ashworth CR. Tendon transfers for radial nerve palsy: use of superficialis tendons for digital extension. J Hand Surg Am. 1978 Nov. 3 (6):560-70. [Medline]. Nalebuff EA, Patel MR. Flexor digitorum sublimis transfer for multiple extensor tendon ruptures in rheumatoid arthritis. Plast Reconstr Surg. 1973 Nov. 52 (5):530-3. [Medline]. Feldon P, Terrono AL, Nalebuff EA, Millender LH. Rheumatoid arthritis and other connective tissue diseases. Wolfe SW, Hotchkiss RN, Pederson WC, Kozin SH, Cohen MS, eds. Green's Operative Hand Surgery. 7th ed. Philadelphia: Elsevier; 2017. Vol 2: 1832-1903. Typical appearance of the hand following rupture of the extensor tendons of the ring and small finger. Intraoperative image of a ruptured extensor tendon with the hand to the left. Note that the tendon ends cannot be reapproximated despite maximum tension. Radiograph of a rheumatoid hand with metacarpophalangeal joint dislocations. These joints are incapable of active or passive extension.